When I was a kid, and I mean like when I was 8 or 9, if someone would ask me what I wanted to be when I grow up—I'd confidently reply "an aerospace engineer." I wasn't really even sure what that was, but I'd heard that's who designs airplanes. What I really wanted to be was an industrial designer—my dream at that age was to design cars, jets, helicopters and vehicles in general. This week, after wrapping up Mad Men Season 2, I managed to sneak Objectified into our Netflix queue at precisely the right moment. 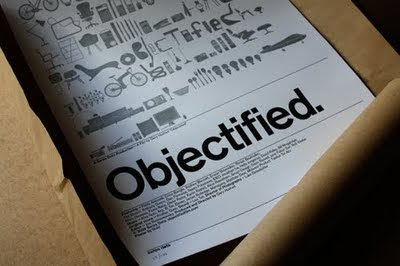 Objectified is documentarian Gary Hustwit's follow-up to his delightfully-designerly doc Helvetica and it features interviews with some of the world's foremost industrial designers. Where Helvetica charms us with more of a history and philosophical debate on typeface itself, Objectified simply exposes the creative process of ID and analyzes where it's going. Even though it's missing just a smidgen of the humor and passion of its predecessor, I can't complain at all about listening to my heroes—such as Dieter Ram, Jonathan Ive and Chris Bangle—pontificate about where things are headed. Needless to say, I was creatively fed. In fact, one of the resounding takeaways of Objectified is that these guys are indeed futurists. Here's a couple quick quotes to whet your appetite. Funny side-note, right when Bangle said that, Mrs. Kyality was busy using her Cricut home plotter to create her own custom holiday gift tags. 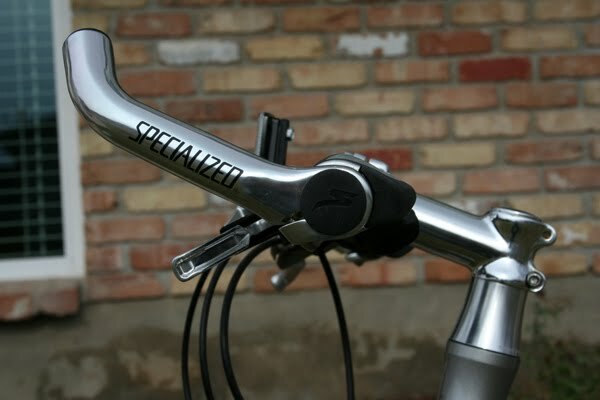 I've had my Specialized Sirrus for well over a year now. 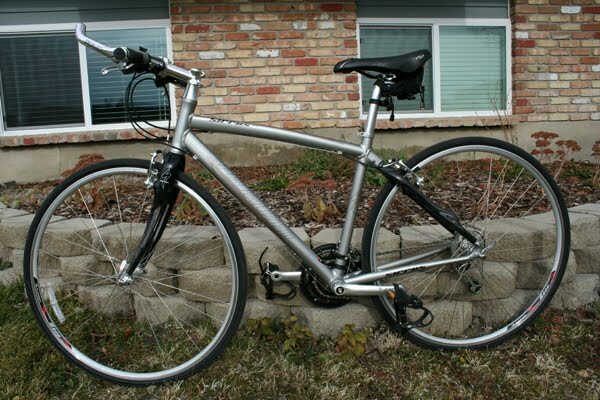 And on the very few longer-ish rides I've taken—I've definitely wished I could alter my hand position on what had previously been a pair of straight handle bars. So this week I determined to add a set of bar ends onto my bike. The debate was between an ergonomic, rubberized set vs. a chrome, mountain bike-style. So based on some solid advice from a handful of co-workers and friends, I (obviously) chose to go with the chrome and I'm pretty stoked on the results. It works aesthetically and after a ride around the hood with the Kyality Kids, I was stoked to be able switch up my hand positioning. 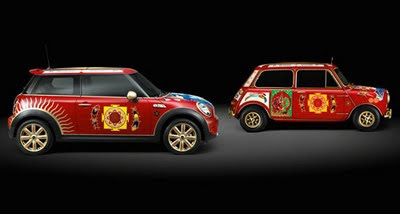 So now I've got a bulldog car and bull-horned bike... nice. A couple of weeks ago I posted about my new addiction, The Dodos. Well, thanks to one @mrlaxcat, I’ve now been turned onto Flickchart.com… and I have to admit, I’m seriously, seriously hooked. 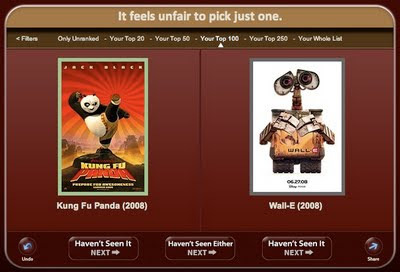 Flickchart.com is a movie rating site that pits one random flick against another and asks you to pick your fave. No apologies, no exceptions—if you’ve seen it, you’ve got to rank it. Period. You can open it to all movies or refine your top 250, 100, 50 or 20 of all time. I’ve had to resort to asking myself things like: Which one of these would I watch right now? Or, which of these have I seen more times? Still, sometimes it’s brutal. The algorithm is pretty basic and works way better the more flicks you rank. It simply puts the movie you chose one slot ahead of the one you don’t. So in the very beginning it can be weird, for instance I had freaking Armageddon stuck in my top 20 for the first day or so… yug. But once you’ve pounded through about 2500 rankings (like me) things finally start shaping up. Anyways, give it a shot. And if you really want a good time, try ranking movies while listening to The Dodos. Can anyone guess which of the two flicks I chose above? 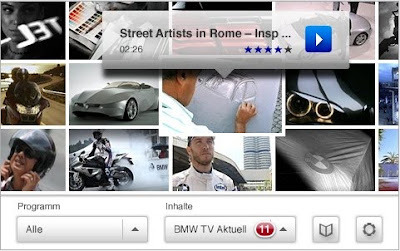 I'm a pretty massive fan of the site: BMW TV. It's constantly updated with amazing, behind-the-scenes vids of crazy, corporate-sponsored BMW footage. Now you can follow the action on your iPhone with the BMW TV iPhone App, a free download from your friendly-neighborhood App Store. Enjoy! 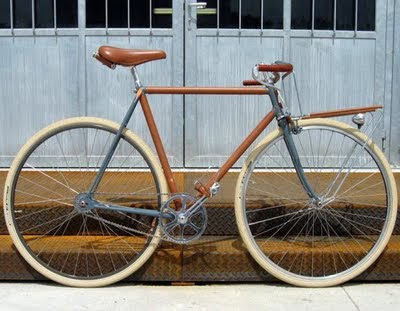 Check out this rad bike called the Leather X Porteur by French designer Nicolas Yvars. 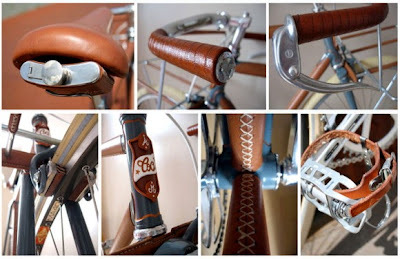 Apparently it’s a one-off handmade project crafted entirely from vintage parts and lotsa leather (includes a matching flask). Click here to enlarge the detail shots.